Jim Hiller, D.J. Smith and Andrew Brewer were named assistant coaches Tuesday, the NHL team announced in a news release. Hiller and Brewer worked as assistants under Babcock last season with the Detroit Red Wings. The Toronto Maple Leafs are filling out new head coach Mike Babcock's coaching staff. Jim Hiller, D.J. Smith and Andrew Brewer were named assistant coaches Tuesday, the NHL team announced in a release. Hiller and Brewer worked as assistants under Babcock last season with the Detroit Red Wings. "I'm excited at the opportunity of working again with Mike, and to also add to the value that both D.J. and Andrew bring," Hiller said. "I've been fortunate enough to work with many great organizations — most recently the Red Wings — and am grateful for the chance to now join the Leafs." The 46-year-old Hiller was in charge of Detroit's power-play unit last season while Brewer, 29, co-ordinated the Red Wings' coaching staff. 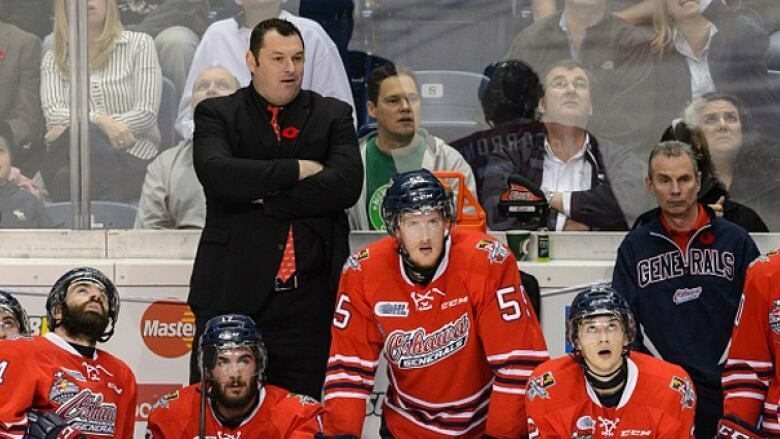 Smith, 38, spent the last three seasons as head coach of the Oshawa Generals and recently guided the Ontario Hockey League club to a Memorial Cup title. The Maple Leafs also announced that Matthew Herring has been named head strength and conditioning coach. The 29-year-old spent the last two seasons as an athletic performance associate with the NBA's San Antonio Spurs. "I'm excited to have them join the organization," Babcock said. "We have a lot of work ahead of us but are all thrilled to be part of the Maple Leafs. We're grateful for the co-operation afforded to us by the Detroit Red Wings, Oshawa Generals and San Antonio Spurs."